In a paper published late last year, a cautious and expert biochemist reports that none of the most popular “life extension supplement” mixes actually extend life span in mice. Stephen Spindler, biochemistry prof at UC Riverside, has been warning us for years that supplements, herbal extracts and nutraceuticals are, on the whole, ineffective for healthy adults, and that some may actually shorten life expectancy. Spindler’s lab has done many life extension studies on mice (summary), almost always with negative results. One recent report included separate life span tests on extracts of blueberry, pomegranate, green and black tea, cinnamon, sesame, curcumin, morin, pycnogenol, quercetin, and taxifolin. One of the themes in his papers is that caloric restriction is the only thing that works consistently, and that many of the treatments that seem to offer life extension are subtley inducing caloric restriction, (and this goes unreported by the investigators). But there are so many substances to test, and each lifespan test in mice is so expensive, that Spindler has suggested gene expression profiles as a shortcut to identifying candidates for further testing. Seven of the eight graphs of survival time in the paper look like this. 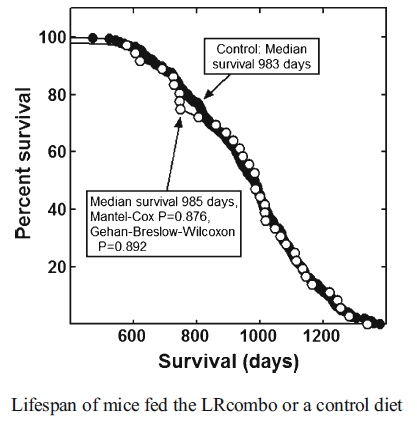 The mice that ate the supplements and the mice that ate ordinary mouse chow had exactly the same pattern of mortality. The eighth treatment group showed slightly shorted life span. Two of these substances (metformin and melatonin) have a credible history of life extension potential in past experiments with mice. Spindler doesn’t comment, and I leave this as an open question. There is credible data in humans for two more (vitamin D and aspirin), both of which have been shown to lower all-cause mortality. I am not aware of rodent life span studies of vitamin D or aspirin, but I trust that one of you, my readers, will point me to a reference. Notably absent were prescription drugs that have been shown to lengthen mouse life span in the past: deprenyl, metformin, and rapamycin. The first two are, in my opinion, suitable for general human use. Why did experiment #8 actually shorten life span (by about 9%)? Spindler speculates that it might be due to the way mice respond to omega 3 fatty acids (fish oil). He cites not-yet published data in which fish oil alone was found to shorten life span. Another possibility he mentions is the well-established fact that plant compounds can mimic the effects of mammalian hormones, and that indiscriminate overdoses of plant extracts can throw the metabolism into dysregulation. Some things about aging metabolism in mice are the same as humans, and some are different. One principal difference is that aging mice die predominantly of cancer, while aging humans die of cardiovascular disease, cancer, and Alzheimer’s disease. Aging mice, like aging humans, are flooded with hormones that dial up inflammation that destroys healthy tissue and heightens risk of cancer [ref]. So the failure of anti-inflammatory ingredients (e.g. omega-3 fats, aspirin) in these mixes to have a life extension effect is particularly puzzling. Unlike humans, aging mice do not suffer from short telomeres, so we might hope that telomerase activators (e.g. silymarin, astragalus extracts, ashwagandha, bacopa) would benefit human life span even if they do not help mice. A partial explanation for the null results is that some of the combinations include anti-oxidant vitamins, which have been shown generally to shorten lifespan. This could be counteracting the benefits of some ingredients that might provide benefits on their own. Likewise for the fish oil that was included in one of the ineffective combinations. What does this leave us? There is epidemiological evidence for mortality reduction in humans from small doses of NSAIDs (ibuprofen, aspirin) and for large doses of vitamin D.
There is evidence from rodent experiments that melatonin, metformin and deprenyl extend life span. There are reports from one lab in Russia that SkQ should be added to this list, but it is not yet commercially available. There is anecdotal evidence and theoretical support for telomerase activators: astragalosides, silymarin, other herbs, carnosine, etc. We expect these might work better in humans than in mice, though evidence is yet thin. Everything else is speculative, and many anti-aging supplements will help some people but not others. There is also the disturbing potential for actual harm, as Spindler emphasizes. None of us wants to think that the mix of supplements we take might be shaving years off our life expectancies. I have taken supplements for a quite serious health problem I had from a long time ago. The supplements have worked. This is not just my opinion it was backed up by a doctor that re diagnosed me a few years ago. When I say they worked I mean about 85% cured. According to what I read and what other doctors told me supplements did not work. So I have my doubts when all these studies seem to say supplements don’t work for anti ageing. I do agree some supplements could be negative. I found out some of the supplements I took (not for anti ageing) produced negative affects and positive at the same time. I had to find out why the negative effects were shown up. It was because I needed another supplement to enable the first to work properly. A similar thing might be needed with some anti ageing supplements. I suppose this type of result would be exactly what you would expect, if aging were the result of a genetic program designed to kill you.